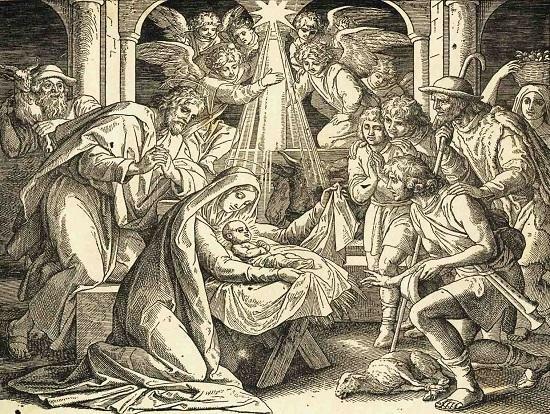 According to popular tradition, the birth took place in a stable, surrounded by farm animals. A manger (that is, a feeding trough) is mentioned in Luke 2:7, where it states "Mary wrapped him in cloths and placed him in a manger, because there was no guest room available for them". ​Shepherds from the fields surrounding Bethlehem were told of the birth by an angel, and were the first to see the child. Popular tradition also holds that three kings or wise men (named Melchior, Caspar, and Balthazar) visited the infant Jesus in the manger, though this does not strictly follow the biblical account. Christmas really began in Rome. Christ was born in Judea, in the village of Bethlehem but his first birthday was celebrated in Rome 300 years later when Emperor Constantine adopted the new faith of Christianity. Church leaders in those time often substituted saints for pagan gods and Christian holy days for pagan celebration. 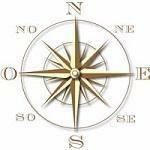 No one knows for certain the exact date of Christ's birth. The feast day of the Romans' old pagan God Mithras, however, fell on December 25, and that was the day chosen to honor Christ. 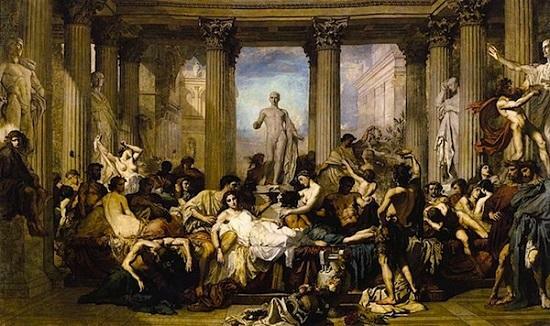 The period between mid-December and early January had long been one of almost nonstop revelry in ancient Rome. It began with the Saturnalia, a winter solstice festival, and ended with the Roman New Year, the Calends. It was a joyous time of good will and sharing. The festival held on December 17 in honor of the deity Saturn and later expanded with festivities through December 23. People exchanged visits and gave gifts, especially at New Year's. Candles and clay dolls were favorites presents; dates, figs, honey and coins were also popular. Following the coming of Christianity, the season became a time of holiness, of reverence for Christ. Kings were believed to have reached Bethlehem. They gave their gifts to the Infant Jesus on that day, and so the Romans, too, began to exchange present on Epiphany. 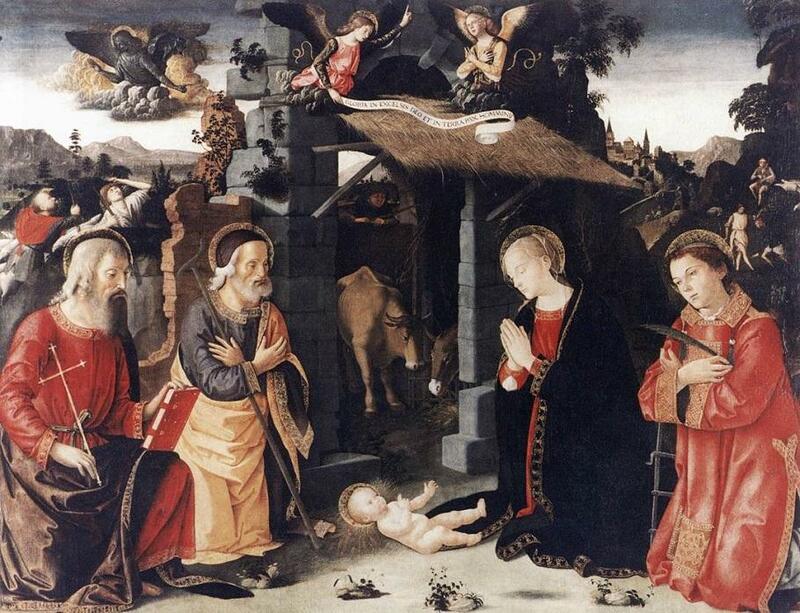 The term "Epiphany" was used by the Greeks to indicate the manifestation of a divinity. Christians began to use the term Epiphany to celebrate and commemorate divine manifestations (such as miracles, signs, visions, etc..). In particular, among these events are: the adoration of the Three Kings, the baptism of Jesus and his first miracle at Cana. Lots of Christmas trees may be seen now days in Italy, but the real focal point of Christmas observances is the Nativity Scene. 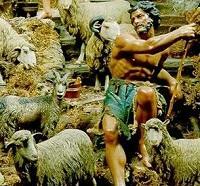 The first "presepe" was created by San Francesco on Christmas Eve of 1223. It was a living nativity scene, with real people interpreting characters of the nativity. Over time real people were replaced by big statues and later with smaller ones, however the live nativity scene is still in use in some towns who now hold " living nativity scene" where all can participate, the biggest and more suggestive one is performed at Sassi of Matera . (The first edition took place in Dec. 2010 and the event is now officially recognized as the world's biggest with people attending from all over Italy and Europe). Catholic Italians celebrate Christmas as a “day of abstinence", on Christmas Eve the family eats a meatless dinner that traditionally is followed by the midnight mass. Normally the whole family gets together for the traditional Christmas Eve's supper (cena). The Christmas day dinner is usually at the grandparents. The most significant meal of the Christmas Day is the lunch or il pranzo. 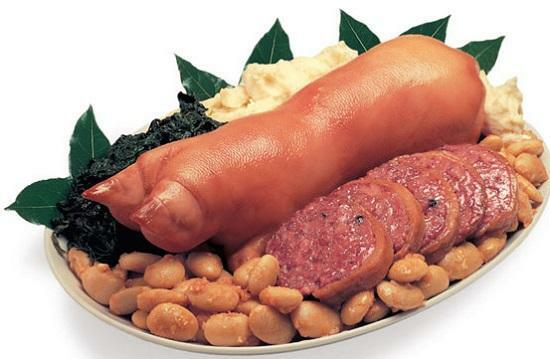 In the northern Italy dishes such as: lo zampone - the skin of the lower pig leg, including the toe little bones, is stuffed with minced meat . Lamb is also enjoyed with mashed potato and lentils. 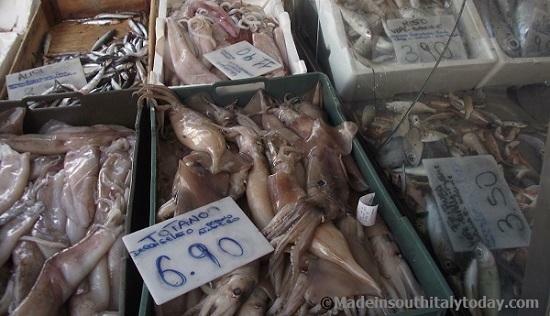 In Rome and the southern Italy the traditional dish of Christmas Eve is "Capitone" a big female eel, roasted, baked or fried. 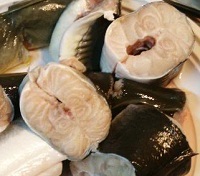 There are still many places where the Christmas Eve dinner consists largely of fish. Mustaccioli , Susamelli and torroni from Calabria. 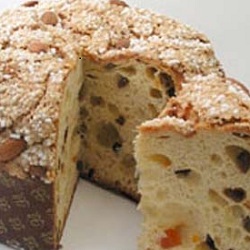 The panettone - the Milanese fruitcake filled with candied fruit. The Pandoro (Gold bread) - similar to il panettone, only without fruits or raisins. The Panforte - Gingerbread with hazelnuts, honey and almonds. 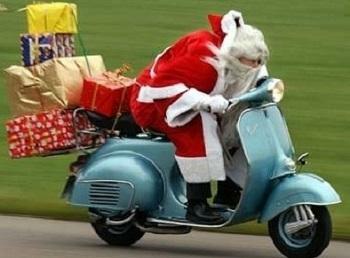 Is there an Italian Santa? 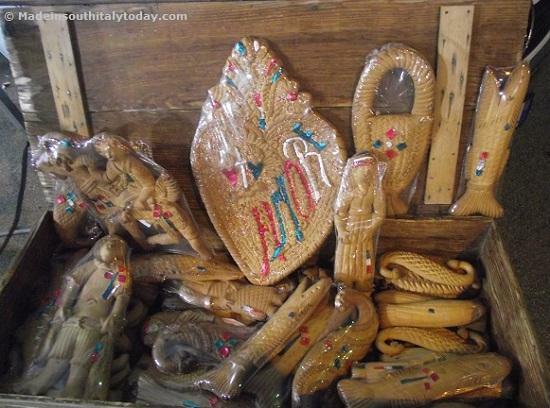 He is known as San Nicola di Bari, because, as tradition says, his bones were furtively transported to this city back in 1087. Saint Nicholas - Also called Nikolaos of Myra, 4th-century Christian saint and Greek, Bishop of Myra (Demre, part of modern-day Turkey). Because of the many miracles attributed to his intercession, he is also known as Nikolaos the Wonderworker. Today, Saint Nicholas is still celebrated as a great gift-giver in several Western European and Central European countries. According to one source, in medieval times nuns used the night of 6 December to deposit baskets of food and clothes anonymously at the doorsteps of the needy. According to another source, on 6 December every sailor or ex-sailor of the Low Countries (which at that time was virtually all of the male population) would descend to the harbour towns to participate in a church celebration for their patron saint. "Christmas" is a compound word originating in the term "Christ's Mass". It is derived from the Middle English Cristemasse, which is from Old English Crīstesmæsse, a phrase first recorded in 1038 followed by the word Cristes-messe in 1131. Crīst (genitive Crīstes) is from Greek Khrīstos (Χριστός), a translation of Hebrew Māšîaḥ, "Messiah", meaning "annointed"; and mæsse is from Latin missa, the celebration of the Eucharist. Christmas, along with Easter, is the period of highest annual church attendance. In Catholic countries, people hold religious processions or parades in the days preceding Christmas. Family reunions and the exchange of gifts are a widespread feature of the season. Gift giving takes place on Christmas Day in most countries. 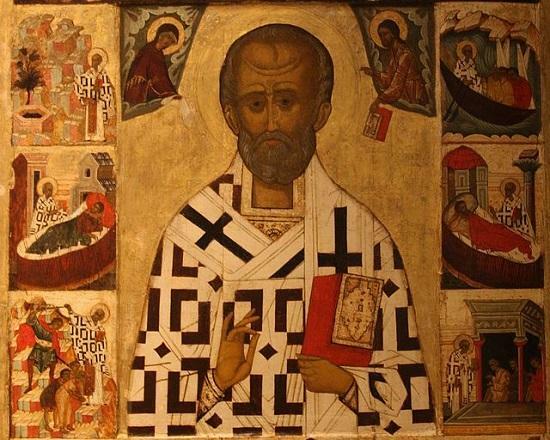 Others practice gift giving on December 6, Saint Nicholas Day, and January 6, Epiphany. 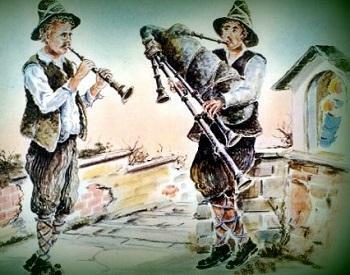 Announcing the arrival of Natale in many parts of Italy was the sound of the "Zampogna" played by local shepherds or "Zampognari". The shepherd bagpipers would come down from the mountains to play the towns (for many of them this was one of the very few times when they'd come to town). La Zampogna (the 'bag' in most cases is made with goat or sheep skin and its name probably derives from the the Aramaic word sum·pon·yah' (which sounds like the italian word “zampogna”) , is an ancient musical instrument that can be found as far north as the southern part of the Marche, throughout areas in Abruzzo, Latium, Molise, Basilicata, Campania, Calabria, and Sicily. The tradition is mostly associated with Christmas, and the most famous Italian carol, "Tu scendi dalle stelle" (You Came Down From the Stars) . 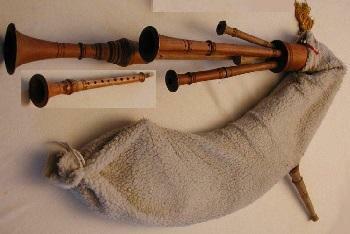 However, there is an ongoing resurgence of the secular instrument often included in folk music festivals and folk music ensembles. Modern day Zampognari still dress much as their ancestors did, and they are a fascinating sight in their shaggy sheepskins vests, leather breeches, or sheepskin leggings. Over their shoulders they wear long woolen cloaks, and their white stockings are bound by leather thongs reaching up to their knees. 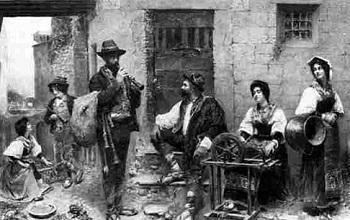 The music of these zampognari and pifferari (known also as 'ciaramellari') seems to have remained basically unchanged for several centuries. Their arrival in town, yesteryear and today, is a cheerful announcement that Christmas is near. 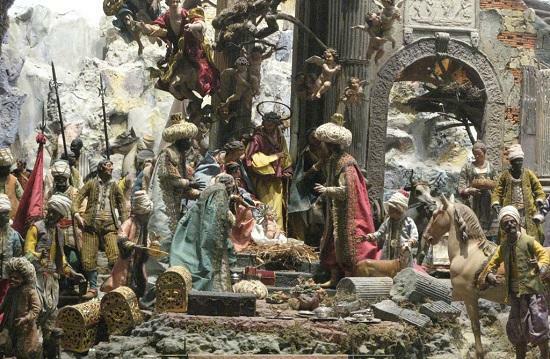 Christmas in Italy is still very much a religious holiday. Officially, the Italian Christmas celebrations start on December the 8th, with the L'Immacolata Concezione or the Immaculate Conception’s Day and lasts until January 6th. The season begins with a "novena", a nine (nove) day-period of special church services ending on Christmas Eve. The "Novena” starts on 17th December and in some towns, during this time, the children go home by home reciting Christmas passages. The Masses of the night before Christmas Day are very mystical and touching. In small mountain churches or big cathedrals, sacred music creates a magical atmosphere. Some Masses are particularly beautiful. Despite the growing trend toward giving gifts at Christmas, a large number of families still save their presents for Epiphany. 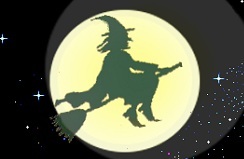 Youngsters believe that a kind old witch, La Befana, delivers the goodies.